You view Rotten Tomatoes ratings before selecting which movie you’re going to go see, you scour Yelp looking for a new restaurant to try and you never hire a contractor unless he’s highly rated on Angie’s List, so why would you hire a marketing coach without the same research? A wolf in sheep’s clothing may seem to be a bit of an over-statement, but if someone is claiming to be something they’re not, and you’re taking advice for your business from them . . . well, let’s just say we’ve heard a lot of horror stories. Anyone can call themselves a marketing coach, but you need to look beyond the self-proclaimed title to see what’s really underneath. If a marketing coach doesn’t have good marketing it’s a pretty good sign they can’t really teach you how to implement the necessary changes in your business. A coach, by definition, trains. You should expect them to show you how to achieve the desired result. If your “marketing coach” hasn’t invested in a mobile responsive website by now, doesn’t have a plethora of customer testimonials, and doesn’t even exist on social media – how on earth do you expect him or her to be able to help you with your marketing? Marketing isn’t like philosophy which is all suppositions and theory, nor is marketing something that can be learned by reading textbooks alone. In fact, most of what is still taught in universities is a bunch of useless terms, phrases, and antiquated acronyms which are largely irrelevant in today’s marketplace. Advanced degrees don’t matter much either, because often, those graduating with their Master’s Degree toss around classically stuffy buzzwords designed to impress peers and intimidate the layperson – and they still don’t understand marketing automation, how to create an effective behavioral marketing campaign, or how to write engaging copy for today’s reader. Sound harsh? We’re calling it like it is, and that’s what we do in marketing coaching. If you don’t want to see things for what they are, then you’re not ready for a coach. But, if you are looking for a marketing coach, then you need to find one who really practices what they preach. You need to be sure you’re working with someone who is actively engaged, on a daily basis, in marketing strategy and implementation. This means they’re drenched in marketing, they live and breathe it – because with today’s rapidly changing marketing landscape – if a marketer isn’t constantly growing, they’re missing out on critical information which can be disastrous to you. Your marketing coach should be someone who understands, not just what the word brand means, but how to create a strong brand. A great marketing coach doesn’t just help you identify your target market, they’ll help direct you in how to get in front of that client. Your coach should be able to keep long-term strategy in mind while directing your day-to-day efforts. We have four questions to ask yourself to determine if you’re ready for a marketing coach which you can find here. You’re looking for someone with experience, how much is up to you. They don’t have to have been doing it longer than you’ve been alive but do find someone who has several years under their belt. Be sure to ask a few follow up questions, like which changes are they seeing that they like, or don’t like? By continuing the dialogue on their experience it will show you how much they’re staying up on current changes. You may not know if they’re telling the truth, but here’s a hint – take notes and Google it after you’re done talking to them. Trust, but verify! You want to find out if they’re a generalist who really understands all aspects of marketing or if they specialize in social media, email marketing, etc. Most marketers (and marketing coaches) have an area where they really excel, so it’s your job to find out if their strength matches your area of weakness. After talking with me, where do you think I’ll need the most help? Listen carefully to their response. Often what you think you want isn’t what you really need. If their answer surprises you – that can be a really good thing! The caveat here is that some coaches are going to coach you only the areas that you specify or in their area of specialty. If that’s the case then just be sure they have the skill-set you need. How long will it take me to get a result? Yes, this is a trick question, but you must ask it! If they tell you that you will be found on the first page of search results in 3 weeks – just know that is not the right answer. What you’re looking for is the coach who responds with something very realistic, or even responds with their own question like, “That depends, how hard are you willing to work?” Now, that’s a good marketing coach response! Who have you worked with who was in a similar position as I am and what were their results? Please, understand we are not suggesting they have to have had a client just like you, in order to be able to coach you. In fact, good marketing coaches are able to see similarities across industries and are often more effective when they don’t work with just one type of person or industry. By asking the above question you’re simply looking for how well they’re able to articulate positive results they’ve had with previous clients. Because marketing coaching can entail individual coaching not sanctioned by the person’s employer, your potential coach may not be able to give you an exhaustive list of companies, because they work in confidentiality. Check out their reviews – those should give you a general feel for the type of coach this person is. All you need to know is, a) does this marketing coach have a process and b) do I think I can follow it? If the answer is yes to both, then great! Focus on what they’re telling you and have that gut check with yourself – does it sound like what you really need? Notice, we did not say “is this what you want?” Many of us don’t want someone else telling us what to do or challenging our thinking – but we do it because we know it’s the only way to grow. One final point on this, your marketing coach may sound a lot different than your friend’s business coach, so don’t let that bother you. Depending on your situation, a good marketing coach is going to take you through some type of marketing planning process before encouraging you to jump into implementation. They are typically more proactive than a typical business coach who allows their client to drive the topic of each discussion. What is it your other clients like best about meeting with you? This is a great way for marketing coaches to give you some different feedback than what you might see in a customer review. We know you’d ask this eventually anyway, but we need to include it on our list because it’s important. This is not an area where you pay minimum wage and expect to get outstanding results. The more experienced and in-demand your marketing coach is the higher the price they can demand. This is one of those areas where you will get what you pay for. If you find someone who is experienced just starting out in coaching it’s your lucky day. But this is an area where you’re hiring a highly skilled and intelligent individual because a marketing coach isn’t just a great marketer, they understand what coaching is and what is not. They are there to hold you accountable, to push you, to speak the truth. Not just anyone can coach others, and even fewer are really great at it. 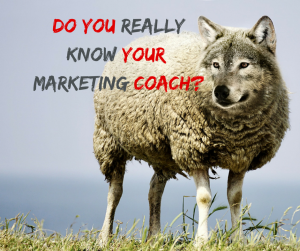 To find a marketing coach who is both a master at marketing and coaching is pretty rare. It takes experience, maturity and personal growth on their part. When someone has the whole package like this, they’re able to charge a premium for their services. After you’ve done your research by looking at their LinkedIn profile, Facebook page, Instagram – whichever platforms they engage on, you should have a pretty good idea if you like them. Once you’ve decided you want to work with them based on what you’ve seen and heard (and their marketing!) that tells you they probably know what they’re doing with marketing and can likely help you attract customers in the same way!